"Guide on Top 5 Reasons Why Customers Hate Field Service"
A great customer service leads to overall increased productivity of the organization. The need for field service will never go away. Machines wear out they break. We all at some point contract with a provider for a home or business projects. When a product requires field service or maintenance, customers expect a well manufactured product in return. Why does a company need field customer service? Satisfied customers are a company’s best brand advocates, proselytizing good customer service work to their entire social network. So, a company’s brand improvement depends on great customer service field. But when the service goes bad, the same advertisement of the field service experience can and does have ill effects on the company’s brand image, costs and future sales. 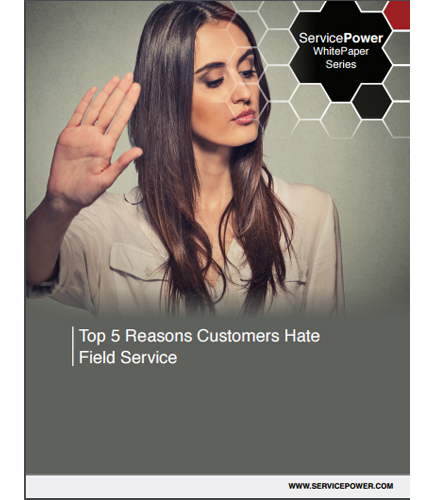 In this whitepaper, ServicePower, an expert in providing field service management, has come up with top 5 reasons why customers hate field service. Download this whitepaper to know those Top 5 reasons and improve your organization's image by learning the loopholes in field customer service.